This scenario has happened to me more than I’d care to admit. I’m in the middle of baking or preparing a meal and realize that I’m out of a key ingredient. After a brief moment of panic, I have to figure out what I’m going to do. Do I drop everything and run to the grocery store? Go next door and ask our elderly neighbour whom I don’t really know? I’d rather do option three: find an emergency ingredient substitution, if possible. Substituting an ingredient isn’t always ideal, but it will do in a pinch when you are pressed for time. Sometimes, it can alter the recipe so you’ll notice the difference, but other times, you can’t even tell. It’s better than scrapping the whole thing though! I have a list of Emergency Ingredient Substitutions of common items used in recipes. I made it into a printable so you can print it out and keep on your fridge or in your Household Binder. Have you ever run out of an ingredient and used a substitution? Thanks for this very useful info! Going to keep this nearby when I’m cooking/baking. 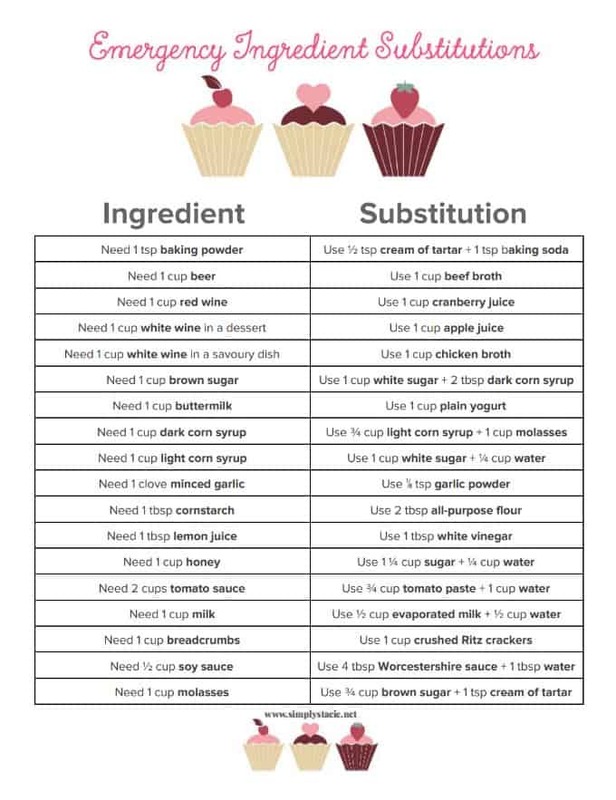 This is a really great list of Substitutions. I did not know that there are so many of them. I will be keeping this list because it will help me with cooking. Thanks for sharing. It will really help me. Great lists, I must print and keep it in my kitchen. These are good to know. It happens to me so often I think I have all the ingredients to make a recipe for an occasion I’m now at the last minute, and I didn’t have the brown sugar or garlic or ughhh!!!! and not in the mood to run to to the store for that one thing! I’ll have to print this out to keep in the kitchen. Thanks! It should work the other way if you have something on the substitution side and don’t have the ingredient! So very helpful, thank you! What a great idea to put all the substitutions in one place. Thank you Stacie. This is great to have on hand. 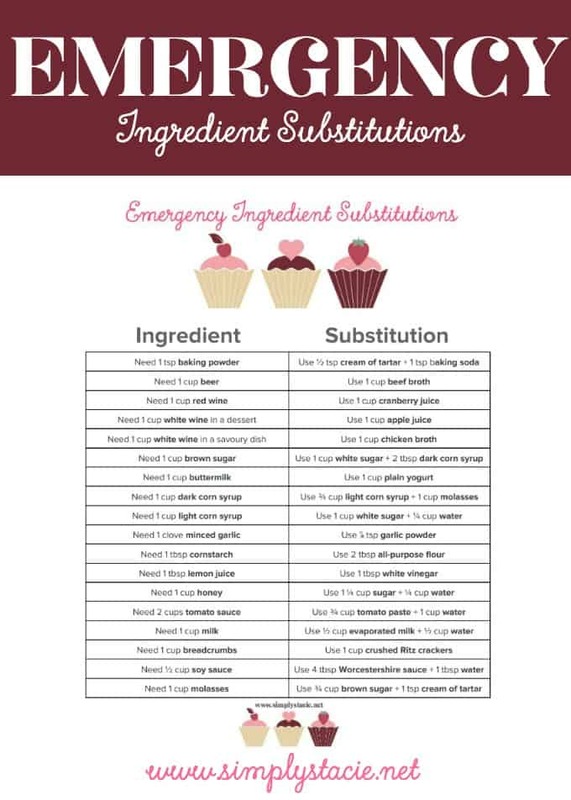 I’ve pinned it on my board and also going to print out to have on hand for when I’m baking and need a substitution….thanks for sharing! I love these substitution ideas. Thanks. Stacie, thank you so much for your list of emergency ingredient substitutions. I had known a few of them like the substitution of canned milk for whole milk. I had never heard of some of them so I learned a few pertinent facts in ingredient substitutions today. Thank you for the great substitution charts. I will print them out for my use! What a great list of substitutions. I don’t always like cooking with wine due to a sulphur allergy in the family so I tip my hat to you for these substitutions of apple juice or chicken broth, thanks very much! Those are good to know. I like the wine substitutions since I don’t usually have wine on hand. These are so good to know and would be handy to print and put in the kitchen! So helpful, I can’t tell you how many times I am all ready to cook a meal only to discover I am missing one stupid thing! This is very nice to know, just in case it happens. I saved your worksheets if it ever arises in the middle of a cook or bake. This is great thanks for sharing, sometimes we need a substitute and I am always lost at what to use, this will come in handy for me!! What a great list to have, I have bookmarked this to my Recipe Favorites! Thanks! That is amazing and so helpful! I am definitely going to make a note of that and put it in the inside cover of my recipe book. I usually am prepared but you just never know! This is handy, thanks! I’ve pinned it for future reference! Thanks for this list. Some of these are ones I have use in the past, but some are new to me and I will add to my repertoire. Thanks for sharing on emergency ingredient substitutes. I don’t have some ingredients at times when I want to bake or cook so this was a big help. 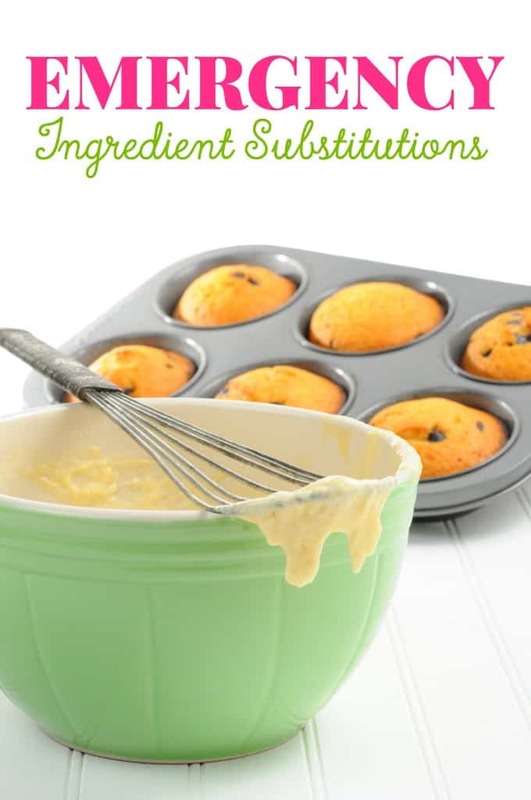 Thanks for the information about recipe substitutions! These are very useful tips. Great lists to have. I should print them off and stick them on my fridge. I enjoyed reading your list of emergency substitutions. I especially took note of the emergency substitutions for buttermilk, lemon juice and soy sauce-which I hadn’t seen before. Even these three will be a great help to me. t Thank you so much for this list. I plan to use it again and again. This is fabulous! Thanks for making it printable! Love this list and really like that you made a list we can download which I definitely will be doing plus making copies for my 3 sisters. Thanks, this is extremely helpful! !